The Open Cardiovascular Medicine Journal is an open access online journal which publishes research articles, reviews, case studies, short communications/letters and guest edited thematic issues on the understanding of scientific advances in the field of cardiovascular medicine, written and reviewed by globally recognized experts. Manuscripts on range of topics including cardiac and circulatory system disorders, heart failure, cardiac surgery and pharmacological treatment, arrhythmias, pacing and cellular electrophysiology, atrial fibrillation, vascular and lymphatic research and other related fields are considered for publication. 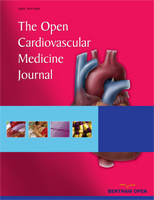 The Open Cardiovascular Medicine Journal, a peer-reviewed journal, is an important and reliable source of current information on developments in the field. The emphasis will be on publishing quality papers rapidly and freely available to researchers worldwide.